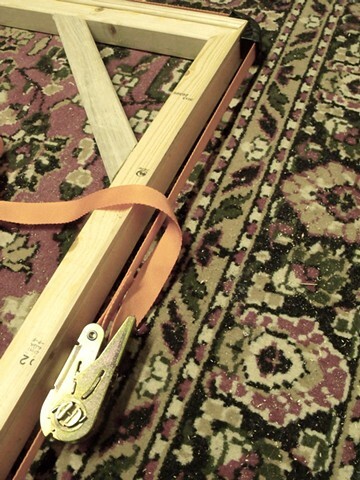 A ratcheting band clamp with four angled, plastic corners is a great tool for gluing frames together, prior to drilling. Together with a steel square, the corners help to ensure that the frame is squared off. This particular band clamp was difficult to find, because of the length of the band I needed. I took the corners from a 1"x 15' clamp bought from Harbor Freight, and used them on a 25-foot band clamp bought online from Woodcraft (in Parkersburg, WV).